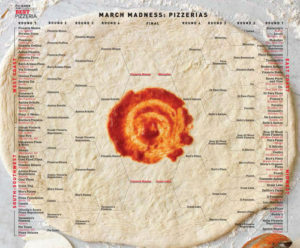 If you’ve ever done internet research on pizza you’ve probably visited two sites: Slice and if you’re lucky, Jeff Varasano’s blog. When I first stumbled upon Jeff’s blog my first thoughts were that this guy is crazy. It was so densely packed with info that it reads almost like a conspiracy theorist’s manifesto. However, two paragraphs in you realize that this guy is a pizza genius. As you follow his detailed account of the trial and error of recreating his favorite pizza from Patsy’s, you will find yourself getting really hungry. The pictures aid in this. Pizza! Pizza! Pizza! Pizza! If you’re in the Atlanta area, you’re in luck because Jeff has turned his home hobby into an actual business. As of last Spring, Varasano’s Pizzeria is open for lunch and dinner 7 days a week . So, if you’re there, no need to cut the latch on your self-cleaning oven or monitor the temp of your pizza stone or order your sourdough starter online. Now you can just pop in and have him make it for you. He’s garnering rave reviews, and made the final eight in the Everyday with Rachel Ray Magazine hunt for the best pizza in the U.S. conducted by the Slice guys, Adam Kuban and Ed Levine. My three favorite Portland pizza spots: Wy’ East, Ken’s Artisan, and our own Apizza Scholls were included. Apizza Scholls made the final eight, too. This entry was posted in Dining on August 27, 2010 by Jules.